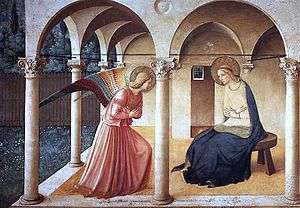 Fra Angelico was born Guido di Pietro at Rupecanina in the Tuscan area of Mugello near Fiesole towards the end of the 14th century. Nothing is known of his parents. He was baptized Guido or Guidolino. The earliest recorded document concerning Fra Angelico dates from October 17, 1417 when he joined a religious confraternity at the Carmine Church, still under the name of Guido di Pietro. This record also reveals that he was already a painter, a fact that is subsequently confirmed by two records of payment to Guido di Pietro in January and February 1418 for work done in the church of Santo Stefano del Ponte. 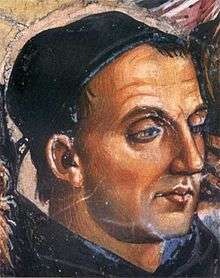 The first record of Angelico as a friar dates from 1423, when he is first referred to as Fra Giovanni, following the custom of those entering a religious order of taking a new name. He was a member of the Dominican community at Fiesole. Fra, a contraction of frater (from the Latin), is a conventional title for a friar. From 1408 to 1418 Fra Angelico was at the Dominican friary of Cortona where he painted frescoes, now destroyed, in the Dominican Church and may have been assistant to or follower of Gherardo Starnina. 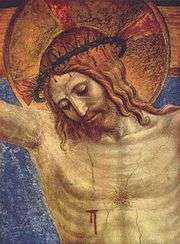 Between 1418 and 1436 he was at the convent of Fiesole where he also executed a number of frescoes for the church, and the Altarpiece, deteriorated but restored. A predella of the Altarpiece remains intact in the National Gallery, London which is a superb example of Fra Angelico's ability. It shows Christ in Glory, surrounded by more than 250 figures, including beatified Dominicans. In 1436 Fra Angelico was one of a number of the friars from Fiesole who moved to the newly built Friary of San Marco in Florence. This was an important move which put him in the centre of artistic activity of the region and brought about the patronage of one of the wealthiest and most powerful members of the city's governing authority, or "Signoria" (namely Cosimo de' Medici), who had a large cell reserved for himself at the friary in order that he might retreat from the world. It was, according to Vasari, at Cosimo's urging that Fra Angelico set about the task of decorating the monastery, including the magnificent Chapter House fresco, the often-reproduced Annunciation at the top of the stairs to the cells, the Maesta with Saints and the many smaller devotional frescoes depicting aspects of the Life of Christ that adorn the walls of each cell. In 1439 he completed one of his most famous works, the San Marco Altarpiece at Florence. The result was unusual for its time. Images of the enthroned Madonna and Child surrounded by saints were common, but they usually depicted a setting that was clearly heavenlike, in which saints and angels hovered about as divine presences rather than people. But in this instance, the saints stand squarely within the space, grouped in a natural way as if they were able to converse about the shared experience of witnessing the Virgin in glory. Paintings such as this, known as Sacred Conversations, were to become the major commissions of Giovanni Bellini, Perugino and Raphael. 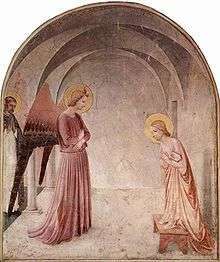 The series of frescoes that Fra Angelico painted for the Dominican friars at San Marcos realise the advancements made by Masaccio and carry them further. Away from the constraints of wealthy clients and the limitations of panel painting, Fra Angelico was able to express his deep reverence for his God and his knowledge and love of humanity. The meditational frescoes in the cells of the convent have a quieting quality about them. They are humble works in simple colours. There is more mauvish-pink than there is red while the brilliant and expensive blue is almost totally lacking. In its place is dull green and the black and white of Dominican robes. There is nothing lavish, nothing to distract from the spiritual experiences of the humble people who are depicted within the frescoes. Each one has the effect of bringing an incident of the life of Christ into the presence of the viewer. They are like windows into a parallel world. These frescoes remain a powerful witness to the piety of the man who created them. Vasari relates that Cosimo de' Medici seeing these works, inspired Fra Angelico to create a large Crucifixion scene with many saints for the Chapter House. 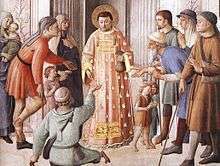 As with the other frescoes, the wealthy patronage did not influence the Friar's artistic expression with displays of wealth. It is probable that much of the actual painting was done by his assistants to his design. Both Benozzo Gozzoli and Gentile da Fabriano were highly accomplished painters. 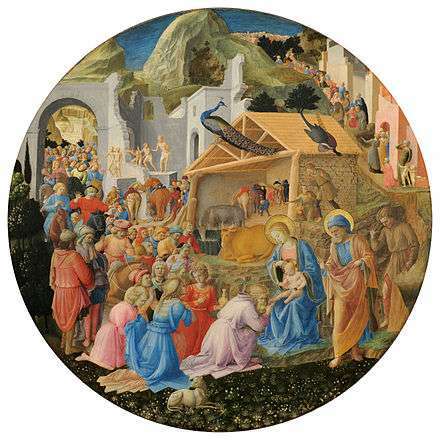 Benozzo took his art further towards the fully developed Renaissance style with his expressive and lifelike portraits in his masterpiece of the Journey of the Magi, painted in the Medici's private chapel at their palazzo. Within the cells of San’Marco, Fra Angelico had demonstrated that painterly skill and the artist's personal interpretation were sufficient to create memorable works of art, without the expensive trappings of blue and gold. In the use of the unadorned fresco technique, the clear bright pastel colours, the careful arrangement of a few significant figures and the skilful use of expression, motion and gesture, Michelangelo showed himself to be the artistic descendant of Fra Angelico. Frederick Hartt describes Fra Angelico as "prophetic of the mysticism" of painters such as Rembrandt, El Greco and Zurbarán. Altarpiece for chancel – Virgin with Saints Cosmas and Damian, attended by Saints Dominic, Peter, Francis, Mark, John Evangelist and Stephen. Cosmas and Damian were patrons of the Medici; the altarpiece was commissioned in 1438 by Cosimo de' Medici. It was removed and disassembled during the renovation of the convent church in the seventeenth century. Two of the nine predella panels remain at the convent; seven are in Washington, Munich, Dublin and Paris. Unexpectedly, in 2006 the last two missing panels, Dominican saints from the side panels, turned up in the estate of a modest collector in Oxfordshire, who had bought them in California in the 1960s. Each cell is decorated with a fresco which matches in size and shape the single round-headed window beside it. The frescoes are apparently for contemplative purpose. They are have a pale, serene, unearthly beauty. Many of Fra Angelico's finest and most reproduced works are among them. There are, particularly in the inner row of cells, some of less inspiring quality and of more repetitive subject, perhaps completed by assistants. Many pictures include Dominican saints as witnesses, allowing the friar using the cell to place himself in the scene. 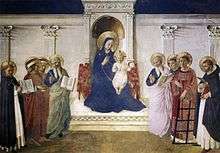 Worldwide press coverage reported in November 2006 that two missing masterpieces by Fra Angelico had turned up, having hung in the spare room of the late Jean Preston, in her "modest terrace house" in Oxford, England. Her father had bought them for £100 each in 1965 then bequeathed them to her when he died in 1974. Preston had been consulted by their then owner in her capacity as an expert medievalist. She recognised them as being high quality Florentine renaissance, but it never occurred to anyone, even all the dealers she approached on behalf of the owner, that they could possibly be by Fra Angelico. They were finally identified in 2005 by Michael Liversidge of Bristol University. There was almost no demand at all for medieval art during the 1960s and no dealers showed any interest, so Preston's father bought them almost as an afterthought along with some manuscripts. Coincidentally the manuscripts turned out to be high quality Victorian forgeries by The Spanish Forger. The paintings are two of eight side panels of a large altarpiece painted in 1439 for Fra Angelico's monastery at San Marco, but split up by Napoleon's army 200 years ago. While the centre section is still at the monastery, the other six small panels are in German and US museums. These two panels were presumed lost forever. The Italian Government had hoped to purchase them but they were outbid at auction on 20 April 2007 by a private collector for £1.7M. Both panels are now restored and exhibited in the San Marco Museum in Florence. 1 2 3 4 5 6 7 8 9 10 Giorgio Vasari, Lives of the Artists. Penguin Classics, 1965. 1 2 Bunson, Matthew; Bunson, Margaret (1999). John Paul II's Book of Saints. Our Sunday Visitor. p. 156. ISBN 0-87973-934-7. ↑ "Commune di Vicchio (Firenze), La terra natale di Giotto e del Beato Angelico". zoomedia. Retrieved 2007-09-28. ↑ "Strozzi, Zanobi". The National Gallery, London. Retrieved 2007-09-28. 1 2 3 Rossetti, William Michael. "Fra Angelico". orderofpreachersindependent.org. Retrieved 1 May 2016. ↑ The tomb has been given greater visibility since the beatification. ↑ "San Marco Altarpiece". Web Gallery of Art. Retrieved 2014-05-29. ↑ Morris, Steven (14 November 2006). "A £1m art find behind the spare room door". The Guardian. Retrieved 2007-09-28. ↑ Morris, Steven (20 April 2007). "Lost altar masterpieces found in spare bedroom fetch £1.7m". The Guardian. Retrieved 2007-09-28. This article incorporates text from a publication now in the public domain: Rossetti, William Michael (1911). "Angelico, Fra". In Chisholm, Hugh. Encyclopædia Britannica (11th ed.). Cambridge University Press.